Coat of Arms (submitted by Bill Krzyzanowski). 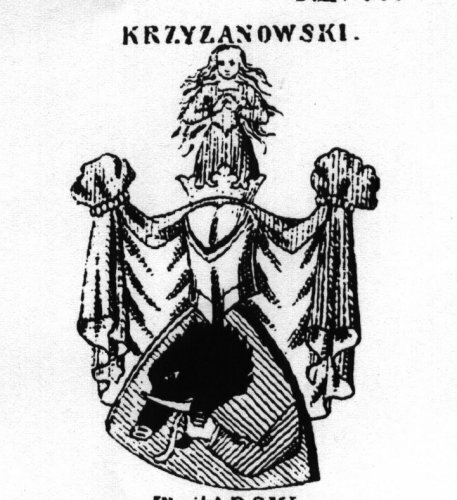 Krzyzanowski family coat of arms found in the books of "Herald" published in 1973 by Bauer and Raspe in Neustadt an der Aisch. 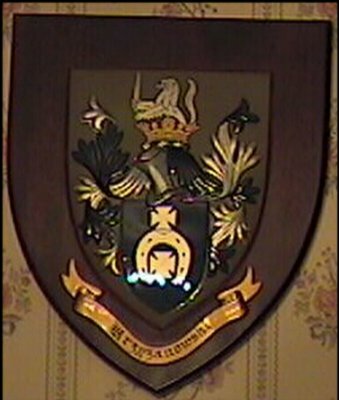 This coat of arms was a gift to Bill Krzyzanowski many years ago in London. All whom enter his dining room admire it. 2. Krzyzanowski family coat of arms found in the books of "Herald" published in 1973 by Bauer and Raspe in Neustadt an der Aisch. 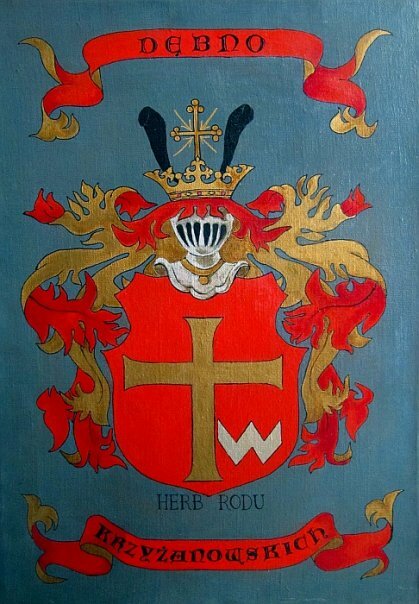 This coat of arms was detailed in an email by Joachim Krzyzanowski and images later sent to me by Martin Krzyzan. A special thanks to Doug Schickler for the English translation. Subject: Genealogische Forschung der Herkunft des Namens " Krzyzanowski"
Vorab habe ich mich in der Universit�t Erlangen in der Bibliothek in Heraldischen B�chern gest�bert und das Familienwappen gefunden. Es ist in dem Buch: Die Wappen des Preu�ischen Adels von J. Siebmachers gro�es Wappenbuch Band 14 Teil 1 auf Tafel 271 zu finden. Das Buch ist 1973 in dem Verlag Bauer und Raspe in Neustadt an der Aisch erschienen. Next I stumbled onto the family coat of arms in the books of "Herald" at the library of the University of Erlangen. 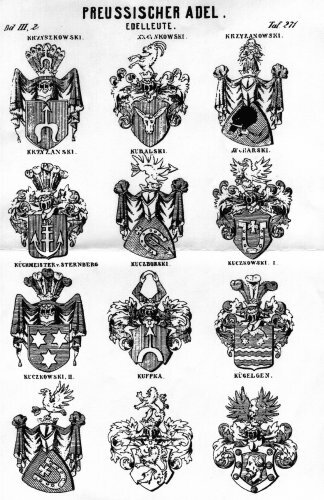 It was in the book: [ed note: loosely translated] The crests of the prussian nobility by J. Siebmachers (book 14, part 1, on illustration 271). The book was published in 1973 by Bauer and Raspe in Neustadt an der Aisch. Schild: Auf rotem Untergrund befindet sich zentral ein Schweinskopf, dessen Unterkiefer ein blau bekleideter , unterhalb desselben schwebenden Armes fasst. Rotgekleidetes Frauenbild mit fliegendem Haar. An image of a women dressed in red with flying hair. The women is carrying a heart in both her hands. Full page scan from the same page. The image in the upper right hand corner is the Krzyzanowski coat of arms. I notice a horseshoe theme with some of these coats of arms and the one above by Bill Krzyzanowski. 3. Hall of Names International - Heritage Classic History Scroll - Coat of Arms. 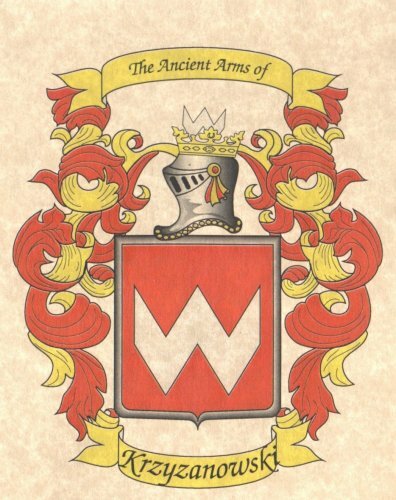 This coat of arms is from the Hall of Names International Heritage Classic History Scroll. The scroll claims to detail the earliest recorded mention of the Krzyzanowski family surname. 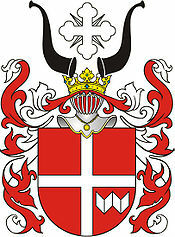 Debno - is a Polish Coat of Arms. It was used by several szlachta families in the times of the Polish-Lithuanian Commonwealth. Swinka (Polish medieval language for "Boar") is a Polish coat of arms. It was used by several szlachta (noble) families under the Polish-Lithuanian Commonwealth. 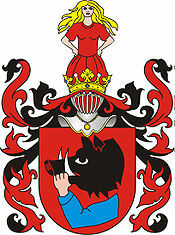 Swinka is one of the oldest coats of arms in Poland. According to legend, the history of the Swinka family began in 712, when a certain Biwoj, squire to Queen Libusza, gave her a giant boar that he had hunted down in the forest. The queen rewarded him with the coat of arms, the village of Swiny in Silesia, and her daughter. Notable bearer: Wlodzimierz Krzyzanowski, General in US Civil War.